Orlando, Florida, May 24, 2017 – (INTUITION) – Marked on TripAdvisor.com as one of Orlando’s Best Sellers, Lake Buena Vista Resort Village & Spa, a resort in staySky® Vacation Clubs’ portfolio, has been receiving massive attention from both guests and the timeshare industry alike. The growing stamp of approval places staySky® Vacation Clubs’ high on the list for booking reservations. Lake Buena Vista Resort Village & Spa was first recognized by TripAdvisor for the 2014 Traveler’s Choice Awards as the 7th Best Family-Friendly Hotel in the United States. In 2015, 2016 and 2017 the property was recognized as an Interval International Premier Resort, signifying top standards and outstanding guest experiences. In addition to achieving recognition by these prestigious networks, Lake Buena Vista Resort Village & Spa receives comments from guests, leading to a deserved Certificate of Excellence from TripAdvisor for consistently earning celebrated reviews. Expedia advertises the hotel as “In High Demand!” and even shows Lake Buena Vista Resort Village & Spa as a VIP Access Hotel, meaning customers receive consistently exceptional service. The popular travel feedback sites, TripAdvisor, Expedia, and Booking.com, have inspired guests to write over 24,000 reviews and upload more than 5,000 photos for the staySky® Vacation Clubs’ portfolio – The Enclave Hotel & Suites, Hawthorn Suites by Wyndham, Lake Buena Vista Resort Village & Spa and staySky® Suites I-Drive Orlando. Beyond review sites, staySky® Vacation Clubs’ resorts’ Facebook and Twitter pages have a combined following of over 60,000 users who constantly receive and engage in updates on the current happenings. staySky® shares videos and photos of the accommodations and pool, weather, and links to blogs containing news on upcoming events. 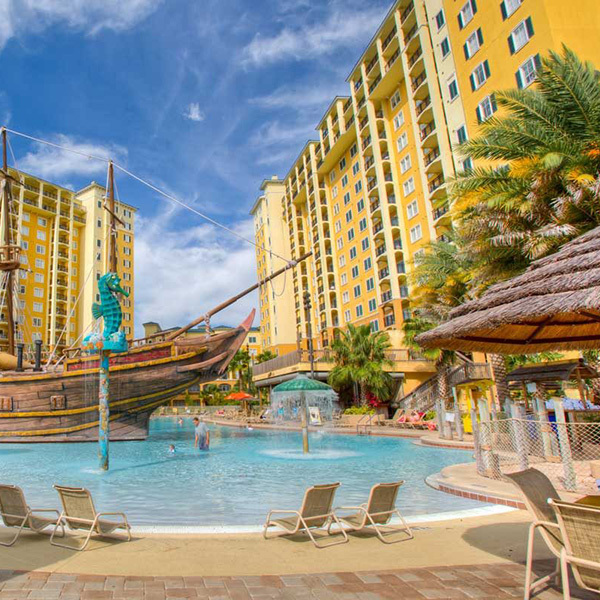 The social sharing led to recognition from USA TODAY in 2017 for Lake Buena Vista’s pool, Pirates’ Plunge, as one of Orlando’s most beautiful pools. staySky® takes vacation membership and engagement to the next level of service with online interactions. Whether guests are looking to make a reservation, see what’s happening at the resort, making requests, or asking for advice, members can enjoy the vacation experience in their daily lives, both at home and away. The continuous yearly growth and recognition by prominent sources poses staySky® Vacation Clubs for exceptional success and is set to continue its status as one of the fastest growing vacation ownership companies in Central Florida. staySky® Vacation Clubs’ luxury hotel amenities are further extended to guests and members at three other staySky® Vacation Clubs properties, all conveniently located in Orlando, Florida and packed with just as much enjoyment.